Built on a bed of volcanic rock, Lanzarote is synonymous with British tourism. But, as an island offering year-round sunshine, there’s life in the old dog yet. Lanzarote is the oldest of the Canary Islands. Though the whole archipelago rose up after a series of earthquakes and volcanic eruptions, Lanzarote is the only island littered with over three hundred volcanic cones. Hovering on budget aeroplane sites can often result in finding a return ticket for less than £50. Result indeed. Flights from Manchester are direct and it is only four hours before you find yourself gliding above the giddy sunbathers. The south of the island is studded with resorts. The cheapest option is camping – a pleasant experience given the weather. It is legal in designated places and is usually €4, or free on La Graciosa. Local transport is well organised, but let be honest – you can’t get everywhere by bus. And would you want to? There are a wide range of organized tours available, but simply walking will find you in tune with the slower pace of island life. At around sixty kilometres in length the island isn’t huge, the most popular sights can be taken in with ease. The port town of Arrecife, as well as being the capital of the island, is historically known for its status as a target for pirates. Needless to say this is no longer a worry, and one can lie on the beach without fear of plunder. I recommend El Reducto Beach for simply sitting on the sand, soft as breadcrumbs, and staring at the water. It is an experience ever so slightly better than Morecambe in February. The History Museum in San Gabriel Castle, if one can pull themselves away from the beach, is free for students. The natural lagoon is fantastically photogenic. One of the island’s most important treasures is the artist Cesar Manrique, who designed such places as Jameos Del Agua – a cave where blind albino crabs live. The best view of this is probably from Mirador del Rio, or failing that from Los Hervideros with its imposing rocky coastline. 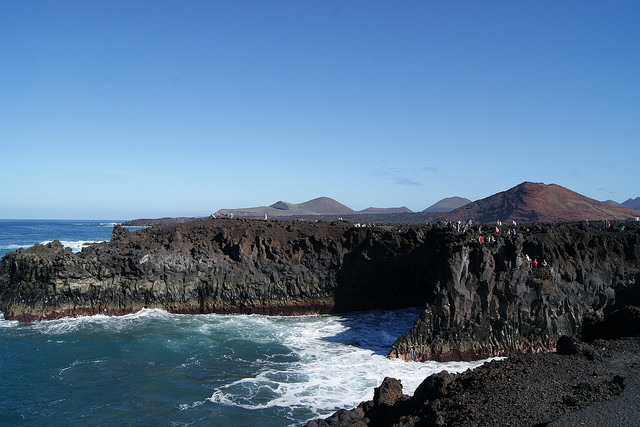 As Lanzarote is basically built on volcanos, the Timanfaya National Park is a must-see. Forget about trees and squirrels! This park is littered with rocks in all their geological glory. What else? Obviously, sampling the local paella and seafood is obligatory. Mojo picon, the spicier option, is delightful, though I favour the mojo Verde. Canarian potatoes challenge our favoured roast variety. Local wines benefit from the volcanic soil of the island, perhaps most notably in La Geria, where the vines drag moisture from the dust. There’s also strong mojito at the Kopas Lounge in the Marina Lanzarote. There are adorable, though strangely expensive postcards in the museum of historical memory in Arrecife. As for souvenirs? The local grog – Ron miel, is rum with honey. Buy it, drink it, give some to friends and drink some more. The weather in Lanzarote is described as an eternal spring, and there’s approximately twenty days of rain per year. Paradise? Probably. Worth visiting? Definitely. Better than England? Well… No comment. Did I consider staying there and purchasing stock in Ron miel? Of course.